Well done, you’ve made it to the end and all will be revealed. The quilt top is completed, just a little titivating to finish the quilt completely now. Download the final instructions and a picture of the finished quilt here. It would be lovely to see photos of your finishes too – why not send them to us, the address is in the sidebar. The weekly blocks will be appearing here again on Mondays very soon, maybe even next week! Or perhaps next week will just be a picture of the completed Mystery. Who knows? This entry was posted in Christmas patterns, free pattern, Mystery quilt, wall hanging and tagged Christmas quilt, free pattern, Mystery quilt on November 17, 2014 by Chris. Very nearly there, but first . . . a few more mitres. Dig out the instructions for Part Three and the links to the videos for a refresher course if you need to. Download the instructions for Part Six here and practice those mitres – you’ll be an expert by the time we’ve finished. Hope you’re pleased with what you’ve made so far. We’re nearly at the end of our Mystery and all will be revealed next week. Don’t forget the final part, November 17th is the date for the diary. This entry was posted in Christmas patterns, free pattern, Mystery quilt, Uncategorized, wall hanging and tagged Christmas quilt, free pattern, Mystery quilt on November 10, 2014 by Chris. 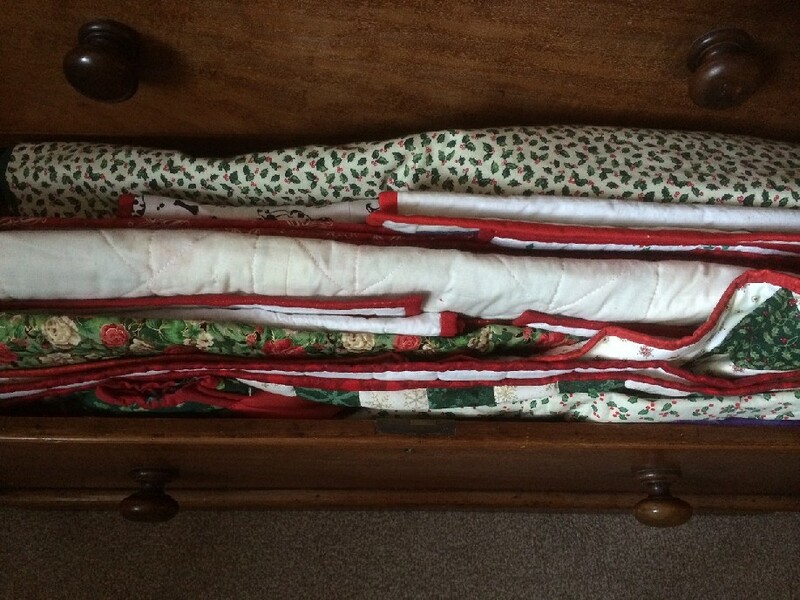 Time to sew those units together – wonder what they’ll end up like? Wonder no more and download the intructions for Part Five here. Not much further to go now . . . see you back here next week. This entry was posted in Christmas patterns, free pattern, Mystery quilt, wall hanging and tagged Christmas quilt, free pattern, Mystery quilt on November 3, 2014 by Chris. Part Four of eight already! No mitres this week – hopefully you have all been successful and are happy with the results so far. This time we will be making more little units – lots of cutting and stitching. Download the instructions for Part Four here. After watching a few videos recently, please can we stress the safe use of those lethal weapons aka rotary cutters. If they are sharp enough to cut through 6 to 8 layers of fabric then they are sharp enough to cut through you. Please make sure you have the blade guarded at all times except when actually making a cut – our students have been heard muttering our mantra under their breath – ‘Guard off; roll and cut; guard on; cutter down’. Do always cut away from yourself as well – not across and most certainly never towards as the consequences if the cutter slips (and they do) don’t bear thinking about: a very nasty gash in your arm if you’re lucky, but a nick in a major blood vessel (no time for an ambulance) if you’re not. And besides which – the blood will ruin all that lovely fabric. Enjoy making this week’s units and we’ll see you back here next week to find out what to do next. This entry was posted in Christmas patterns, free pattern, Mystery quilt, Uncategorized, wall hanging and tagged Christmas quilt, free pattern, Mystery quilt on October 27, 2014 by Chris. This week we learn about mitres! Lots of diagrams to help you with this technique which many of us find scary, but then wonder why when we actually try it – and it works. Be brave – give it a go! Download Part Three instructions here and get your mitres done. If you are still confused there is a blurry video – but good explanation on You Tube. Just don’t, please, use the rotary cutter the way demonstrated – it is so dangerous to cut across yourself and even more so to leave the guard off the cutter when you put it down – she very nearly sliced her fingers at one point. Another good and brief video (with safer use of a cutter!) is here, but when I was watching it ground to a halt and stuttered about a minute from the end – but there was enough information there to get the idea. There are plenty of other videos up there but these two were brief and came closest to the method in the pattern. Good Luck – it is easier than it sounds, honest! This entry was posted in Christmas patterns, free pattern, wall hanging and tagged Christmas quilt, free pattern, Mystery quilt on October 20, 2014 by Chris. Last Monday you should have downloaded the requirements list and cutting instructions so hopefully today you can’t wait to get stitching. Download the first set of instructions here and dive in! No more talking – you’ll be wanting to get on with making the first part of this little wall-hanging. This entry was posted in Christmas patterns, free pattern, Mystery quilt, wall hanging and tagged Christmas quilt, free pattern, Mystery quilt on October 6, 2014 by Chris.